A parfait is a layered sweet treat that can either be served as a breakfast specialty or as a dinner dessert. Commonly it is made with yogurt, granola, nuts and blueberries, strawberries or other fresh fruits – however, Paleo people like to un-common their lives and branch out while discovering new delicacies. Going dairy-free can be a difficult task at first, but it can also be the most delicious thing you have ever done. Here you will start with almond milk, a tasty Paleo dairy substitute, and soak 1/2 cup of chia seeds in it. To streamline the process you can make the chia pudding the night before to help speed up breakfast prep time and if you enjoy eating the apples cold, they can also be made the evening before – just layer before serving. This is a high-carb recipe, so it’s something to enjoy every now and then. And as always, feel free to adjust the sweeteners to your taste, especially if your apples are in season and deliciously tart. Before we go any further, what exactly are chia seeds? They are newly popular in the Paleo crowd, so you may have heard of them, but what are their benefits and why should you be eating them? Here’s the quick answer: they are tiny black seeds which originate from a mint family in Central and South America, they are a powerhouse of fiber and Omega-3 fatty acids and they provide you with slow-release energy throughout the day. And here’s the longer story about chia seeds, in case you are super-curious about what goes in your body. If you still want to add a bite of crunch to your parfait, then a sprinkle of Paleo granola will do the trick. Whether you try it crunchy or not, this is a great recipe to know, and to love. Combine the chia seeds, almond milk and vanilla extract in a small bowl. Cover and place in the fridge to soak for at least 2 hours, ideally overnight. To make the caramel apples – melt the coconut oil in a pan and add the apples. Allow the apples to sauté for a few minutes then add the coconut sugar and coconut milk. Allow to cook until a thick caramel is formed (stirring continuously) and the apples start to soften. Add the cinnamon and salt, then stir to combine. 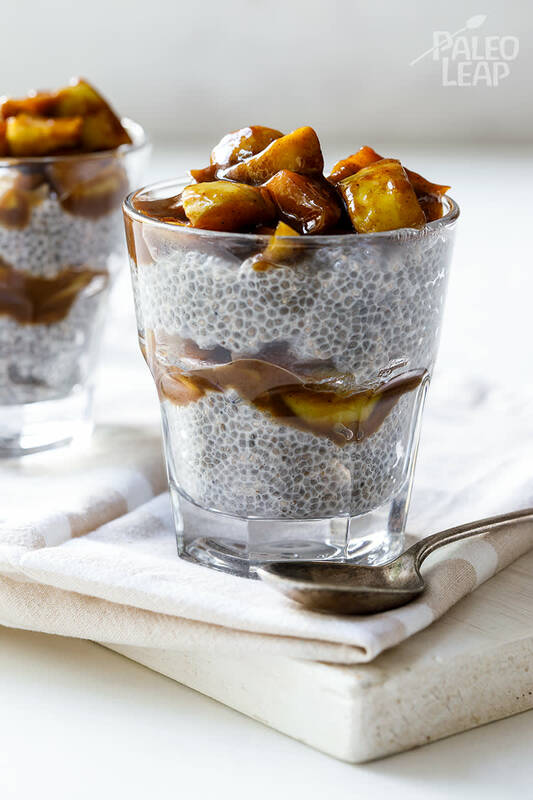 Layer the chia pudding with the caramel apples and serve.